In the nose is sweet bourbon, with soft sugar and malt, hints of cocoa and mild roast. The flavor is layers upon layers of malt, bourbon, and a mix of dark dried stone fruits coated in dark chocolate. The body of this dark, looming brew is full and coating, which begs for sipping and savoring. The finish on this unique lager is exactly what you don’t get from all the big, barrel aged beers out there...the crisp and clean lager finish the Wolverine State Brewing Co. is known for. Each sip of Massacre brings a new experience and with a rich aged cheddar, or creamy aged gouda the hidden secrets of Massacre can be released. 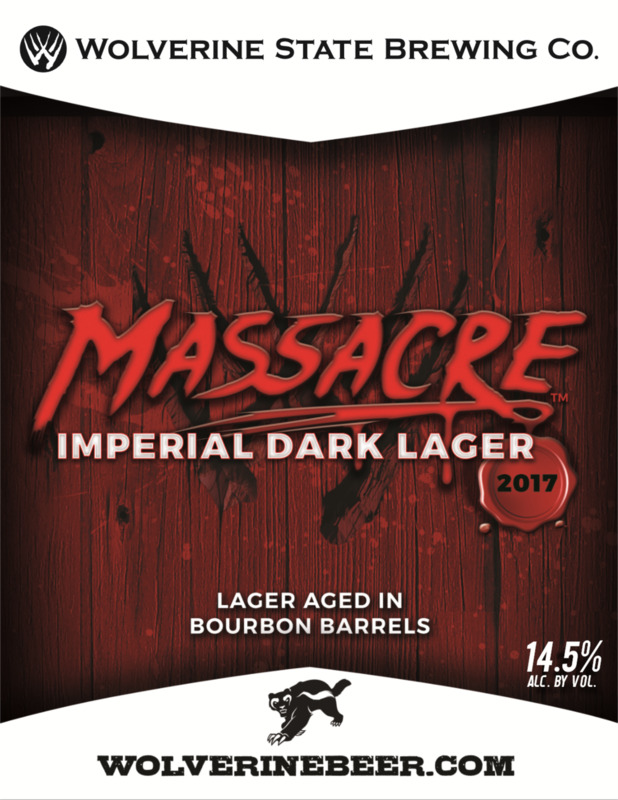 Each bottle of Massacre was hand-dipped by one of Wolverine State’s staff members, from the brewers, to the kitchen staff, to the bar staff, everyone at Wolverine had a hand in this year’s Massacre. We hope you enjoy this lager as much as we enjoyed getting it to you.